Have you ever had to meet a group of people at a restaurant or bar only to find out upon arriving that the place is packed and you and your group needs to plan on heading elsewhere? As a result you may have to make several individual phone calls or send a number of text messages to coordinate the change of plans. Wouldn't it be nice if you could send the group a text message at once? Arrived - Text your friends to let them know your location by sending message to arrived [at] kiboze.com. Block - Block another user from your Kiboze network by sending an IM name or phone number to block [at] kiboze.com. Connect - Join someone else's network on Kiboze by sending the number of the person's network you want to join to connect [at] kiboze.com. 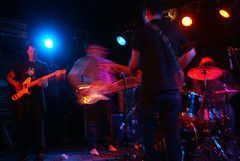 Info - Get gig and event information about a band by sending a the band name to info [at] kiboze.com. Login - Login in to Kiboze to start receiving your friends' messages by sending "on" to login [at] kiboze.com. Logout - Log out of Kiboze and stop receiving your friends' messages by sending "off" to logout [at] kiboze.com. Meetup - Plan a meetup at a particular venue by sending the venue name to meetup [at] kiboze.com. Shop - Compare prices. Kiboze returns the best prices it can find on the Web by when you send the product name to shop [at] kiboze.com. Shout - Send a shoutout to your buddies, for example to ask who's up for seeing a movie or going to the beach by sending a message of your own choosing to shout [at] kiboze.com. I think Kiboze is a very cool service which draws some comparisons to Dodgeball, the SMS messaging service purchased by Google in May 2005. The only thing that disturbed me with Kiboze was the number of required fields in the registration page. It seemed to be a lot of information for a text messaging system. For example, why would Kiboze need to know my education level? However, there could be some other reason that this information might be important to Kiboze and I would be interested in find out what to it is. Kiboze is positioned to promote local events and venues via text messaging. Basically, they can determine the location of individuals via the meetup and arrived message types and then send addition local venue and event promo messages - including plugging local bands. I am not one hundred percent sure what other types of promo messages Kiboze is looking to send but I assume it will be related to local events and venues. In summary, Kiboze appears to be a forward thinking startup which leverages SMS text and IM messaging via mobile phones to create a wireless social network of users thus making it easy to send a text message to a large group of friends. For more information and product updates be sure to check out the Kiboze blog.